Italian Owned & Operated. Serving all of Carroll County! More value for your $$$, largest menu available for delivery service. Our robust menu has a variety of dishes that won’t leave anyone hungry, take a look. We have the greatest happy hour in town and it doesn’t stop there, check out all we have going on. For accessibility we have locations that cover most of Carroll County, we’re never out of reach. 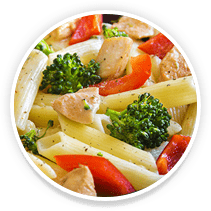 Belisimo’s is a family owned and operated Carroll County restaurant with five locations including a full-size family restaurant, catering, delivery, and carry out. The family comes from a long line of hard working people with roots in Cefalu’ Sicily. Their maternal grandmother came from Sicily through Ellis Island in 1931. She is the oldest of 10, who worked endlessly to immigrate her siblings to the US one by one. Each staying at her home until they were ready to live on their own. Then she would bring over another sibling until she immigrated the entire family. Finally, in 1954 at the age of 42, she made time to start her own family and gave birth to Maria, their mother. Their father, Francesco “Frank”, immigrated from Cefalu’, Sicily in 1966 on a very long and slow 1-week boat ride. His hunger for the American dream, drove him to work tirelessly to start a family and build a life for them. In 1968, Frank saw a picture of Maria at her aunt’s home and asked if he could meet her. After much resistance from her mother who wanted her to marry an “American that would give her a better life”. Eventually, Maria agreed to meet Frank and their love was undeniable. They married in 1972 and have been together ever since. They had four sons and one daughter… Frank, Jr., Robert, Anna, Nick, and John. In 1981, while Maria was pregnant with their 5th child, all of whom were under the age of 5, Frank had a life threatening accident. After the accident, instead of collecting disability, he went to school and ultimately opened his own business building custom homes, HVAC, home improvements, house flipping and rental properties. He insisted that all of the children help with his businesses from a very young age which in turn helped them cultivate the work ethic they have today. They were also raised growing fresh vegetables in the family garden…. canning homemade tomato sauce Friday mornings, making pizza dough from scratch, watching the Dukes of Hazard and eating homemade pizza. They always enjoyed mealtimes as a family and worked together. So it was only natural that ultimately the children would follow in their parent’s footsteps and start a business together. Growing up, Frank and Maria, established savings and then invested it in a rental property which provided the children the opportunity to attend college…. It was a must that they all received their bachelor’s degrees. While at the University of Baltimore completing their four-year degrees, Frank, Jr., Anna & Rob met someone who worked at a struggling sub shop in Parkville, MD after only being open for six months. In February of 2002, they pulled together and took over that sub shop, turned it around to become successful and thus the beginning of Belisimo’s. In October 2003, just one year after buying the sub shop, they opened another location in Sykesville. In May of 2004, they asked their brother John to get involved in the business and expanded to Rosedale and Westminster. In September of 2005, came the Finksburg location… which was a lot more involved as it includes a 12,000 square foot building, 2 bars, restaurant, carryout, delivery, catering in-house and off-premise, weekly karaoke, live music, dart and pool leagues. A few months later, the lease was up for their Sykesville location so they moved across the street to a larger location behind Century High School. The New Windsor location opened in September of 2012 and in January of 2014, they moved the Westminster location to Pennsylvania Avenue. Belisimo’s Is All About Family! Between 2005 -2008, all 5 of Frank and Maria’s children were married and between 2006 and 2014, Maria and Frank became the proud grandparents of 9 girls and 7 boys. Discover the delicious family food and atmosphere for yourself at one of our five locations. 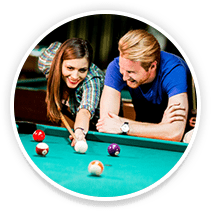 Enjoy restaurant dining, 2 full-size bars, dart board/pool games and weekly entertainment at our Finksburg location. And if you can’t dine in or pick up, we will deliver to you. Also, if you are having a celebration, party, family gathering or business meeting, contact us to cater your special event. Fresh homemade pizza dough, sauces, soups, salads and more. Delicious hand spun milkshakes in a variety of flavors. Enjoy overstuffed subs and generous portions on all of our menu items. Everyday Happy Hour, 11am-7PM **Finksburg only. Delivery area covers most of Carroll County. 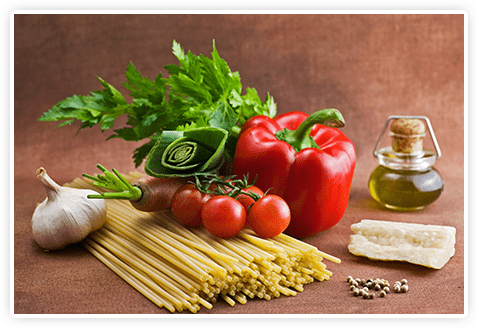 Diverse menu available for delivery, restaurant on wheels! While at the University of Baltimore completing their four-year degrees, Frank Jr., Anna & Rob met someone who worked at a struggling sub shop in Parkville, MD after only being open for six months. In February of 2002, they pulled together and took over that sub shop, turned it around to become successful and thus the beginning of Belisimo’s. In October 2003, just one year after buying the sub shop, they opened another location in Sykesville. In May of 2004, they asked their brother John to get involved in the business and expanded to Rosedale and Westminster. In September of 2005, came the Finksburg location… which was a lot more involved as it includes a 12,000 square foot building, 2 bars, restaurant, carryout, delivery, catering in-house and off-premise, weekly karaoke, live music, dart and pool leagues. A few months later, the lease was up for their Sykesville location so they moved across the street to a larger location behind Century High School. The New Windsor location opened in September of 2012 and in January of 2014 they moved the Westminster location to Pennsylvania Avenue. Stop by any of our 5 Carroll County locations and become part of our family!